Getting pulled over for drunk driving is a scary experience and a criminal offense with potentially serious consequences. But what if you’re pulled over with a minor in your car? DWI with a child in the car in Texas takes that already very serious criminal offense and ratchets it up considerably. Not only do you face enhanced penalties for having a minor passenger in your vehicle, but you could face a child protective services investigation as well. If you’re involved in this type of case, you need a Texas DWI attorney on your side. What Happens If I’m Pulled Over for DWI with a Child in the Car in Texas? If you’re pulled over for driving while intoxicated (DWI) with any passenger who is younger than 15, you can be charged with DWI with a child in the car in Texas. The law applies regardless of whether the child is your child or not. Furthermore, this charge applies even if you’re not involved in an accident. In other words, the child doesn’t have to be injured or involved in a crash for prosecutors to pursue this enhanced type of DWI. 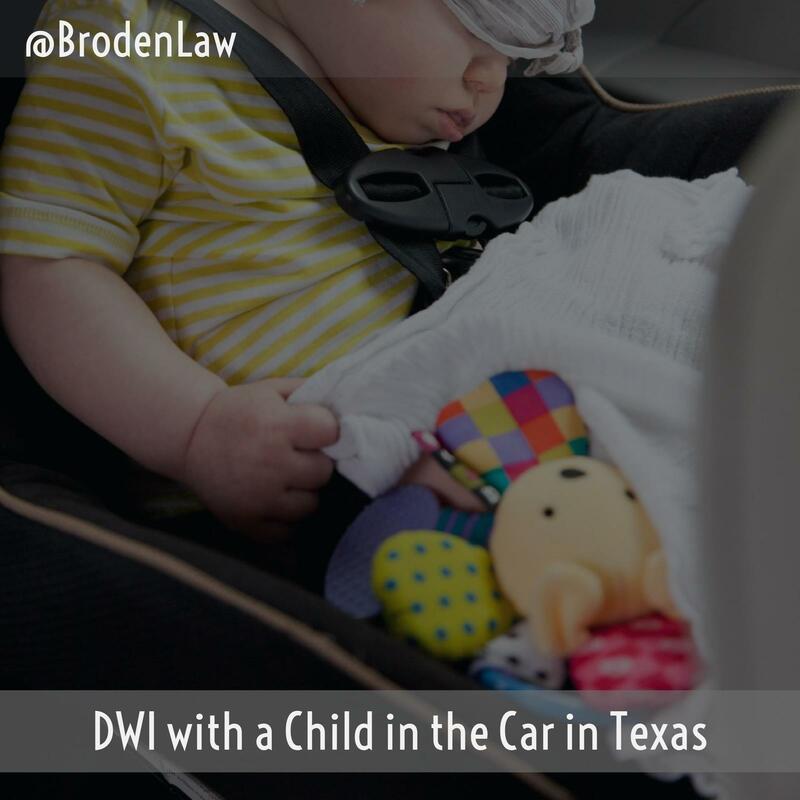 Under the state penal code, DWI with a child in the car in Texas is a state jail felony. This is different from a regular DWI, which is a misdemeanor. Because driving drunk with a child passenger is punished as a felony, you can face serious penalties, including a fine of up to $10,000 and between 180 days and two years in state prison. Additionally, you may also be required to perform community service, attend alcohol abuse education programs, complete probation, or have an ignition interlock device installed on your vehicle. It goes without saying that any crime involving children is punished more severely than criminal offenses that don’t involve kids. The way the law sees it, children don’t have the ability to protect themselves. They rely on adults — typically their parents — to keep them safe from harm. When you drive drunk with a child in the car, you put yourself, your child, and everyone on the road at risk. If you’re convicted of DWI with a child in the car in Texas, you’ll have a criminal record. This can stop you from getting certain jobs or professional licensing. For example, teachers or daycare workers are likely going to have a difficult time finding any employment if they’ve been convicted of DWI with a child in the car in Texas. The same is typically true for bus drivers and anyone who works with kids. A drunk driving charge is always a serious matter. A conviction has the potential to derail your career and damage your personal life. Get in touch with a Texas DWI attorney today to discuss the options in your case.